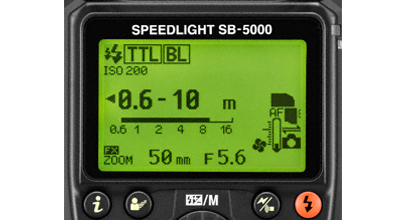 Light it right with the SB-5000—our first radio-controlled Speedlight. Fast, reliable, and versatile, the SB-5000 offers unparalleled lighting performance in the field and the studio. Radio signals allow working distances of 30 m and enable complex on- and off-camera setups: now you can work in any environment in which the line of sight is obstructed or an optical signal might be weakened by bright sunlight. The new onboard cooling system allows more than 100 rapid-fire shots to be captured with the flash operating at full power. And for photographers who can’t lose a moment when the story breaks, the light, compact SB-5000 features uncluttered controls for intuitive operation. Engineered to meet the demands of professionals in the field or in the studio, the SB-5000 is an i-TTL Speedlight compatible with FX and DX-format D-SLRs. This Speedlight operates as a hot shoe mounted flash unit, wireless commander or remote unit and is part of the Nikon Creative Lighting System. This is the first Nikon Speedlight to offer wireless radio control, which removes the need for a direct line of sight between the master and the slave and increases reliability when shooting in bright sunlight. For rapid-fire situations, Nikon’s new built-in cooling system increases the number of consecutive firings and eliminates unnecessary cut offs. 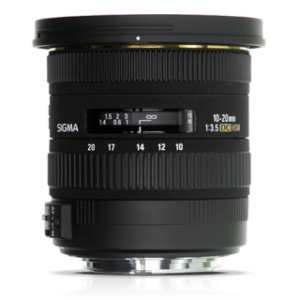 Other features include a guide number of 34.5, and a wide FX-format zoom range of 24-200mm (14mm with wide panel). Streamlined controls and menus ensure smooth operation while the compact, lightweight design provide comfortable on-camera use. 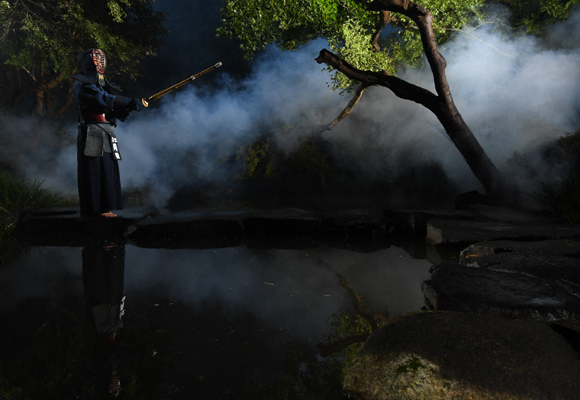 Three illumination patterns offer total control over flash coverage for specific shooting environments. The built-in wide panel and bounce card, plus the supplied diffuser dome, combine with Nikon’s optional colour filters to extend your creative options further. 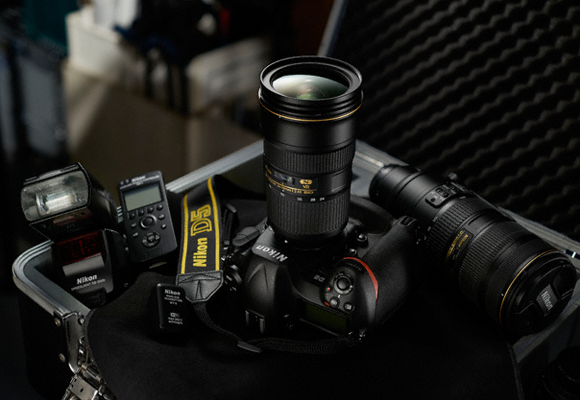 Built to conquer difficult shooting situations, the SB-5000 fully supports the new radio-control function in Nikon’s Creative Lighting System. Now you can fire single or multiple flashgun setups using the SB-5000 and the WR-R10 Wireless Remote Controller. The SB-5000’s ability to respond flexibly to remote lighting challenges lets you create and control almost any flash setup, including complex multiple arrangements. When partnered with the WR-R10 Wireless Remote Controller, up to six groupings of SB-5000 units are supported. 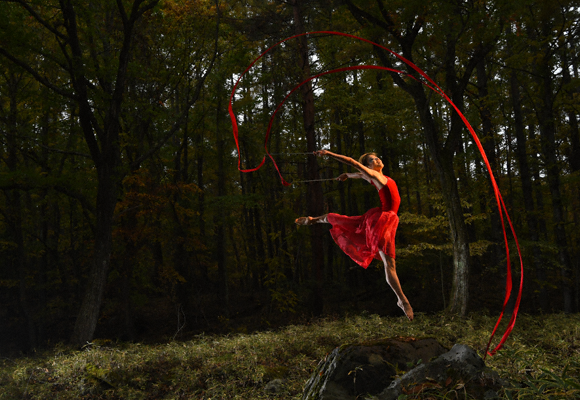 Optical control is also fully supported, which means legacy Speedlights can still be used for multiple flash setups. From the red carpet to the runway, the SB-5000 is engineered to stay cool under pressure. In order to handle rapid-fire situations, the SB-5000 incorporates Nikon’s new Speedlight cooling system—a world* first in onboard temperature control for clip-on compact units. 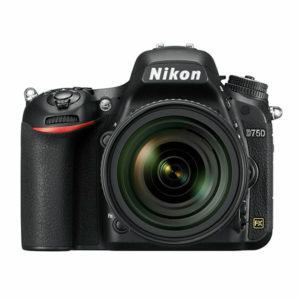 Fast and reliable, it achieves an extraordinary 120 shots at 5-second intervals, or 84 shots at 3-second intervals. More than 100 consecutive shots can be captured with the flash operating at full power. The system suppresses heat generation within the flash head to prevent it from overheating: thermal protection has never been better. * The SB-5000 boasts the worlds-first onboard cooling system among clip-on type compact flash units, as of September 1, 2015. 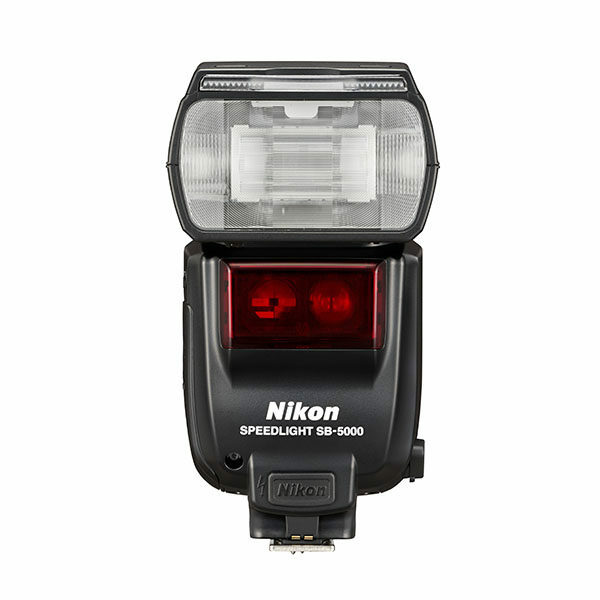 At the heart of the SB-5000 is Nikon’s i-TTL (intelligent Through-The-Lens) flash control, which enables Nikon Speedlights to share critical exposure information with CLS compatible D-SLRs. The SB-5000 can be radio controlled as part of an Advanced Wireless Lighting setup or controlled traditionally using line-of-sight optical control. Operational refinements include unified flash control, which adds an extra level of system control. Now you can operate the SB-5000 or change its settings from the camera menu, or a computer running Camera Control Pro 2, when the unit is attached to the camera body. Lighter than its predecessor and more intuitive to operate, the SB-5000 has been redesigned with convenience in mind. You’ll notice the difference as soon as you fit the SB-5000 to your camera, or pack it in your travel bag: the compact flash body weighs in at just 420 g. The uncluttered control panel allows for a large and easily legible information display. The rotary multi-selector and the ‘i’ button give quick access to commonly used or personalised functions: for instance, the ‘i’ button instantly displays key flash settings for single flash photography or Advanced Wireless Lighting as a list. 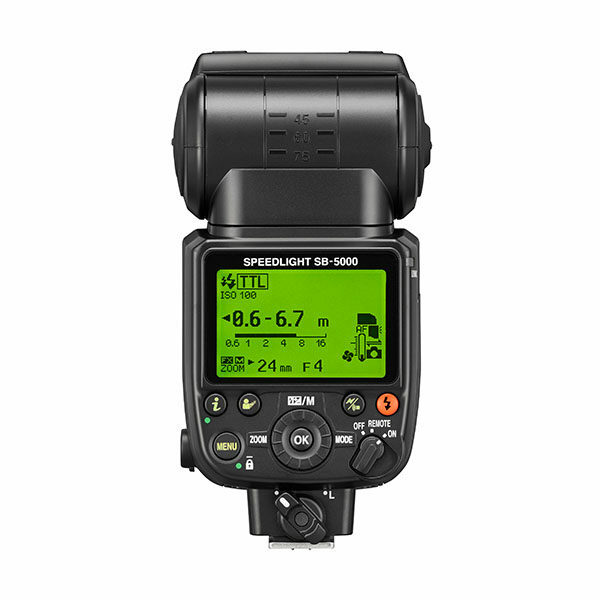 As with its predecessor, the SB-5000’s flash head tilts down to 7° or up to 90°, and rotates 180° horizontally to the left and right.